Bitcoin is a crypto-currency (an encrypted digital currency that resides only on the internet) developed by a Satoshi Nakamoto (a pseudonym). It does not exist in paper or coin format. Think of it as an ATM card where you can buy goods and services without using cash. But you don't go through a bank - you are essentially your own bank but you go through third parties to process the transaction. I was at 7 Sins Bar when I saw their sign saying they accept Bitcoin. Whoa!!! Since I've opened a Bitcoin account in Bali last year, I haven't made any transaction yet. 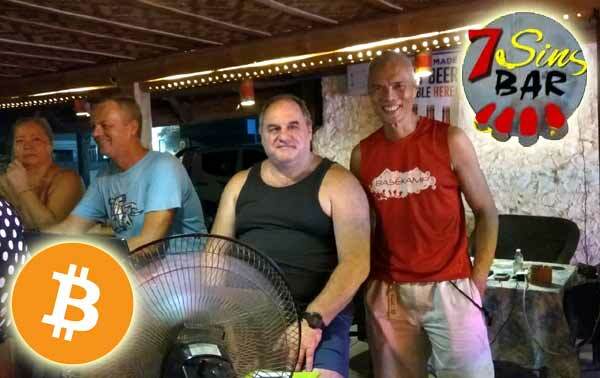 I couldn't find any establishment in the Philippines accepting Bitcoin until now. Total charge for a P100 pineapple juice was BTC .00093206 (BTC 1 = PHP 120,169.51). Abraham received BTC .0008733 which leaves me with a transaction fee of BTC .00005876 or PHP 7.06. I was surprised to find out it's a 7% transaction fee. This is higher than most banks! The transaction was fast and painless. I put in the amount and scanned his QR code and in a few seconds, the transaction was confirmed. Transactions are completely anonymous but you can see the money trail through the Block Chain - so no one can squeeze-in fake Bitcoin. Yes, you need wifi. I talked to the bar owner, Abraham, and got into a conversation about global finance. He makes money-talk riveting like a spy novel. He's quite a renaissance man - scuba diver, freediver, pilot, forex trader, military, law enforcement, meditator, etc. He reminds me of my yoga teacher, Veer, who was a human Swiss Army knife. To make the story even better, he agreed to my web proposal with payment in Bitcoin! I would more than gladly do business with a company supporting Bitcoin. The 7% user fee is unsettling. I still have to double check what happened here. But setting that aside, Bitcoin is empowering. The banks cannot rig the system (so no more subprime market meltdown! ), it cannot be counterfeited (because of the Block Chain feature) and no government can stop it (unless they crash the entire internet). If only more people will use this currency and if only more establishments will accept Bitcoin payments, the banks and their manipulations would be a thing of the past. (July 13, 2017) You will find charges vary depending on who you use for Bitcoin transactions. Some companies charge higher than 7% up to 20% and others charge less than 1%. You will find the ones with the cheaper charges will have a higher turnover.